Palya is a kannada word used for ‘Sabzi or Pan Fried Veggies’, seasoned with a little quantity of natural spices. Palya is a side dish, which is served with roti, chapati and rice, along with dal or sambar. This dish is, very commonly, prepared veggie in Northern part of Karnataka (Southern part of India). Cluster beans is one of the finest veggie food source for diabetic and high blood pressure sufferers, cluster beans have the highest fibre content among all vegetables, which in turn prevents a rapid rise in blood sugar levels after a meal. I am preparing this veggie in a very simple way using some natural herbs. My mother used to prepare this veggie oftenly, I have learnt it from her. Here, I have modified a little bit accordingly. It is a dry veggie, can be given in lunch box, it won’t drip out of box. It can be prepared within 15-20 minutes (cleaning and chopping apart), isn’t it great! Let’s see the preparation of this tasty and healthy veggie. It is good for health to use home made coconut powder, as it provides natural oil to the body, which is better than processed oil. I am using very less oil while cooking, and coconut powder will cover remaining short come of oil. You can prepare dry coconut powder in home, it is fresh and tastier than ready made coconut powder (desiccated coconut powder). I will show you how to make coconut powder in your kitchen. Cut one dry coconut into small pieces or grate it and grind it to a fine powder with the help of mixer and store it in a bottle. 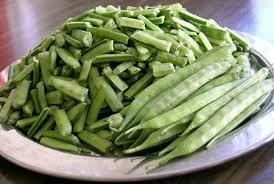 If you store it in Refrigerator, it will be fresh for a long time. Wash the cluster beans with plane water. Remove the ends of beans (tip and tail) with hands so that strings will come out. Cut them into small pieces by hand or by knife. You can cut them into any size and shape you want. Keep them in a plate aside. Wash and drain the coriander leaves. chop them into small pieces and keep it in a small bowl. Wash and clean green chilly and crush them into very small pieces or you can make paste of it. I, normally, make fine paste of green chilly so that it will, uniformly, spread all over the veggie. Keep it separately in a small bowl. Heat a Kadhai (or Frying Pan) on medium flame and pour oil into it. Add mustard seeds, wait until they splutter completely. Add chana dal and udad dal to it. Stir them continuously until they become golden brown. It may take one or two minutes. Add green chilly paste or crushed green chilly and stir them for 10 to 15 seconds. Add haldi powder and hing to it. Add chopped cluster beans to it and Sprinkle 1 tea spoon of salt and 1/4 tea spoon of sugar over it. Mix all the ingredients with the help of a ladle (long handled spoon). Close the kadhai with lid and allow it cook for 10 minutes on low heat. While cooking the vegetables, if you sprinkle salt and sugar (required quantity) over it. It will make the vegetable to leave the water in it and cook it in that water itself, so that it will be cooked evenly and softly. It will help to retain the colour, flavor and taste of the vegetable as well. Open the lid and check whether beans are cooked or not. you can check it by taking one piece of beans in hand and press it with fingers. If it is cooked, it will be soft enough. If you feel it is little bit harder, Sprinkle few drops of water over it, close the lid and cook it for further 5 minutes. Open the lid, sprinkle chopped coriander leaves and dry coconut powder all over the cooked vegetable. Mix them well and close the lid. Allow it to cook on low heat for 1 or 2 minutes and remove from heat. Now tasty and healthy Chavali kayi palya is ready to serve. You can prepare it for lunch or dinner.